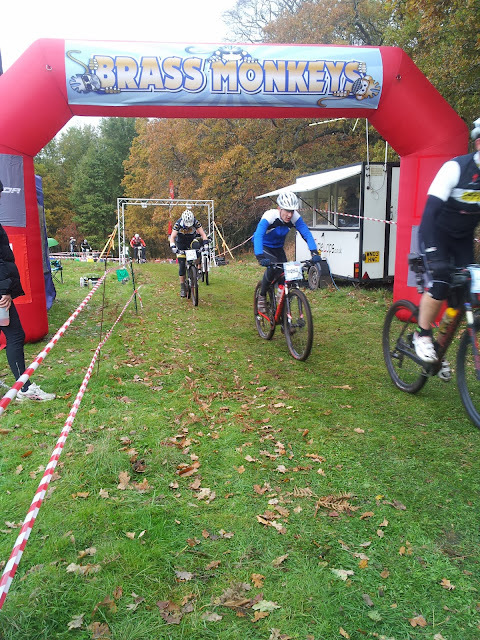 Yesterday I took part in my first mountain bike race. 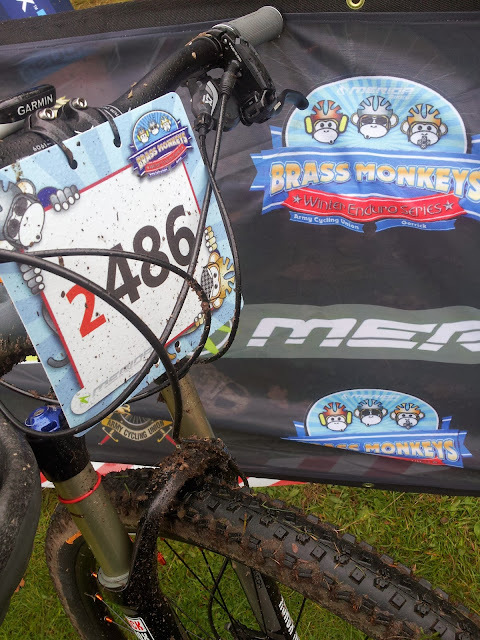 The Merida Brass Monkeys Winter Enduro Series. It's a four event series in the south east run by Gorrick and the Army, featuring some outstanding venues chosen for their suitability for enduro mountain bike racing and their natural beauty. All the venues have features like fast flowing singletrack interspersed with fire track and mixed with enough technical sections to keep you on your toes. The options available are 1hr beginner, 2hr standard and 4hr endurance with a 3hr option for 50+ males. I opted for the 2hr race as I'd heard the 4 hour was really tough. The race start time for the 2hr is a relaxed 11.30am so I didn't have to leave home too early. I was doing the race with my mates Matt and Richard and Richard's friend Dean. We all went up in Richard's mobile bike mechanic van so we had all the tools we'd need if anything went wrong with our bikes. We got there is plenty of time and collected our race numbers. We then set our bikes up and did a little warm up before the race start. We needed it as it was freezing. I opted to wear my Dare 2B gillet to try and keep me warm enough at the start but no too hot later on in the event. There was a mass start for each race distance and the 2hr being the most popular meant there was a big bottleneck at the beginning of my race. Having riders in front of you help you see which line is the best to take when you're riding unfamiliar ground. The course was a variety of terrain but being predominantly woodland there was lots of roots. Naturally they were quite slippery. I had many foot down moments to control the bike from sliding out from under me. The other hard terrain was when the ground was very dry and loose, especially when cornering. 29ers were clearly in the majority with a small number of 26" bikes and at least one cyclo-cross bike. I used my Felt Nine 30 29er and it was great for most of the course. Only the tight turns were slow on my bike. 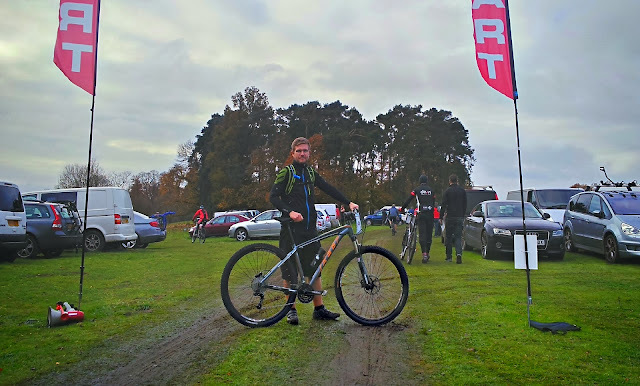 It really excelled on the connecting fire roads where I was able to accelerate very quickly and overtake some of the slower riders that were difficult to get past on the singletrack. There were many riders faster than me and I always tried to accommodate a pass where possible without having to slow down myself. The course was too narrow in places to allow this all the time though. After my first lap I knew I'd miss the cut off to do four laps so paced myself accordingly. Laps 2 and 3 were easier to push hard as I was now familiar with the lap. With 2 miles left on my last lap I knew I was getting tired and was feeling it in my legs. Those last 2 miles seemed so much longer! Crossing the finish line I was pleased with my performance and knew I'd given it 100%. The other 3 were all disappointed with theirs. Two were faster than me and one was slower. I didn't come anywhere near close to winning anything but I was far from last so I'm pleased with myself. I'll definitely be doing another. If you want to sign up for any of the remaining 3 rounds, visit http://armycyclingunion.co.uk/?page_id=419. I might even see you there.